Over 60 new councillors, more than 30 poll toppers and significant vote gains across the 26 Counties. 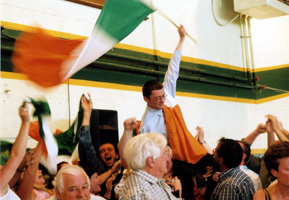 This was the news from the Sinn Féin performance in the 2004 local elections, as the party made gains in 31 out of the 33 city and county councils in which it fielded candidates. So who topped the poll, who was re-elected and who are the new Sinn Féin councillors? In the Cavan County Council area, Sinn Féin took 12% of the vote, up 3.11% on 1999, and elected three councillors. They were Paddy McDonald in Baileborough, Pauline Tully-McCauley in Ballyjamesduff and Charlie Boylan in Cavan. Charlie topped the poll with 1,262 votes and was elected on the first count. In Cavan Town Council, Sinn Féin elected Brian McKeown, while in Cootehill John Martin and Harry McCabe were elected. There were no Sinn Féin County Councillors elected in either Carlow or Clare county councils and in both council areas the Sinn Féin candidates polled 2% of first preferences. In Clare, Paddy Barrett, Gerry Malone and Cathy McCafferty were the candidates running in three of the six wards. In Carlow, Declan Sherrin, running in Tullow, was the only Sinn Féin candidate. The Sinn Féin vote in Cork City Council doubled since 1999 to 8%, with the party electing two councillors. Jonathan O'Brien topped the poll in the North West ward while Annette Spillane was a new seat, elected on the sixth count in the Northeast ward. In all there were 15 city, county and town councillors elected in Cork. In Cork County Council, Sinn Féin elected its first councillor, as Martin Hallinan was elected on the tenth count in the Midleton ward. Sinn Féin took 5% of the first preferences in Cork County Council. In Cork Town Councils John Desmond was elected in Bandon, Anne O'Leary was a poll topper in Bantry, as was Cionnaith Ó Súilleabháin in Clonakilty, while Paul Hayes now joins him on the council. Kieran McCarthy was elected in Cobh, Seamus Coleman was a new seat in Fermoy, as was Willy O'Regan in Mallow and Gina Hennessy in Middleton. Roisín O'Sullivan held the party seat in Passage West, while Donnacha Ó Seaghdha was a new seat in Skibbereen. Martin Hallinan held his seat in Youghal and running mate Sandra McLellan is a new councillor. There were significant gains for Sinn Féin across the county, with nine councillors elected, four in the county and five on the town councils. Sinn Féin won 14% of first preferences on Donegal County Council, up over 9% on 1999. Thomas Pringle topped the poll in the Donegal Town ward of the county, with 2,334 votes, and was elected on the first count. The three new Sinn Féin county councillors began with Pearse Doherty in Glenties. He came in second with 1,892 votes and was elected on the fourth count, while Pádraig Mac Lochlainn also topped the poll and was elected on the first count in the Inishowen Ward. Sinn Féin's fourth county council seat in Donegal came from Tony McDaid, who won the last seat in the Letterkenny ward. Sinn Féin went into the Donegal elections with two town council seats in Bundoran and Buncrana and apart from the three county councillors, Sinn Féin also elected three new town councillors. They were Eugene Duffy in Ballyshannon, Darren Lalor in Buncrana and Gerry McMonagle in Letterkenny. Michael McMahon held his seat in Bundoran as did Pádraig Mac Lochlainn in Buncrana. The four councils in Dublin were the focus for Sinn Féin in the region since the election of six councillors, four in Dublin City and two in south Dublin, in 1999. This time around, there is representation for Sinn Féin in three of the four councils, with ten seats on Dublin City Council, where the party won 18% of the vote. Larry O'Toole topped the poll in Artane, with 4,497 votes in a ward where the quota was 2,802. Tony Smithers topped the poll in Ballyfermot with 1,970 votes and was elected on the fourth count. Ray Corcoran topped the poll in Ballymun/Whitehall with 2,270 votes. Nicky Kehoe topped the poll in Cabra/Glasnevin with 3,609 votes. His running mate Áine Ní Gabhann polled 397 first preferences. In Clontarf, Peter Lawlor polled 1,484 first preferences but didn't get elected. Robert Sargent came second on the first count in Crumlin Kimmage and was elected on the third count. Killian Forde topped the polled in Donaghmede and was elected on the first count as did Dessie Ellis in the Finglas Ward. Sandra Sludds also ran for the party in this ward and she polled 446 first preferences. Christy Burke also topped the poll in the North Inner City ward, with 1,869 votes, while his running mate Ciarán Mac Annraoi polled 585 first preferences. Christy was elected on the fifth count. Daithí Doolan came in second on the first count in the Southeast Inner City and was elected on the fourth count, while Andrew O'Connell was elected on the sixth count in the Southwest Inner City. In Fingal, Sinn Féin took 5% of first preferences and a seat in Mulhuddart, where Martin Christie topped the poll with 1,910 votes. There were three Sinn Féin councillors elected in South Dublin. Shane O'Connor topped the poll in Clondalkin and was elected on the first count, with 2,421 votes. Mark Daly was second on the first count, with 2,138 votes in Tallaght Central, and was elected on the fifth count. Seán Ó Cadhla was the second Sinn Fein candidate in this ward and polled 1,007 votes. Cathal King also ran second on the first count in Tallaght South with 1,782 votes, and was elected on the eighth count. Galway City Council was another breakthrough council for Sinn Féin. The party polled 8% of first preferences and won a seat for Daniel Callanan in the East and North Ward. Ann Marie Carroll narrowly missed out on a seat in the West ward after coming second on the first count. Daniel is the first Sinn Féin councillor on Galway City Council since 1921. In Galway County, Dermot Connolly was elected in the Ballinasloe Ward, while Jason Devlin won a seat on Ballinasloe Town Council. Kerry County Council was a breakthrough area for Sinn Féin in 1999 and this was re-affirmed in 2004 when the party won 8% of first preferences and two county council seats. Toireasa Ferris retained the party seat in Tralee while in Listowel Robert Beasley was elected on the last count, a gain on 1999. Anthony Curtin also won a seat on Listowel Town Council, while Maisie Houlihan and Cathal Foley were returned to Tralee Town Council. Sinn Féin's Paddy Wright held his seat on Athy Town Council while in Kilkenny Kevin Dunphy narrowly missed out on the last county council seat in Piltown. Brian Stanley came in second on the first count in Portlaoise, winning a new county council seat, while also retaining his seat on Portlaoise Town Council. Sinn Féin won 4% of first preferences in Laois. In Leitrim, the Sinn Féin vote surged to 11% of first preferences. There were two council seats won. In Ballinamore, Martin Kenny topped the poll with 860 votes and was elected on the first count, with the highest vote of any Sinn Féin candidate in the county since 1957. In the Manorhamilton Ward, Michael Colreavy was also elected on the first count. In Longford Town Council, Sinn Féin's Jimmy McDonnell won a seat as the party took 4% of first preferences across the county. Sinn Féin took 17% of the first preferences on Louth County Council, up 7.32% on 1999 and made major gains across the county. One county councillor has now become five and three town councillors has risen to six. A previously long suffering Pearse McGeough was the most popular winner in the county, topping the poll in the Ardee Ward of the county council and elected on the fifth count. Imelda Munster was elected in Drogheda East. Thomas Sharkey and Jim Loughran were elected from the Dundalk/Carlingford Ward. In town councils, Sinn Féin held Jim Gavin's seat in Ardee, while in Dundalk Sean Kenna and Kevin Meehan were elected. In Drogheda Borough, Dom Wilton and Mathew Coogan took new seats for Sinn Féin. Sinn Féin won 4% of the first preferences in Mayo, with Gerry Murray retaining his Swinford Council seat. Gerry topped the poll in Swinford with 1,782 votes and was elected on the first count. In Ballina, Peter Clarke won a new seat for Sinn Féin, as did Dave Keating in Westport and Noel Campbell in Castlebar. Once again another surge in the Sinn Féin vote, with the party taking 9% of first preferences and new seats. In the county council elections, Joe Reilly held his Navan seat. He was second on the first count with 1,585 votes. Michael Gallagher topped the poll in Kells, winning a second seat for Sinn Fein. In the town councils, Sinn Féin won a new seat in Trim with Caroline Ní Loinsigh and in Kells Conor Ferguson won a first seat for the party. In Navan Town Council, Joe Reilly retained his seat, with Ann Gibney taking a new seat for the party here, while the group narrowly missed out on a third seat. In Westmeath, Sinn Féin polled 5% of first preferences and Paul Hogan made the historic breakthrough of winning a seat on Athlone Town Council. In electoral terms, the home of Sinn Féin's first TD would almost be termed a stronghold and yet here was the first election in nearly 20 years without an Ó Caoláin on the Sinn Féin ballot paper. But Caoimhghín still played a pivotal role in the election preparations and strategies in the county. Sinn Féin took 31% of the first preferences here and added seats across the county. Matt Carthy topped the poll in the Carrickmacross Ward, winning a new county seat for the party. Jackie Crowe topped the poll and retained a seat in Castleblaney. In Clones, Pat Treanor came in third on the first count and won a seat on the third count. Sheila McKenna also polled well in this ward. In the Monaghan county ward, Sinn Féin elected three councillors, with the party coming first, third and fourth on the first count. Sean Conlon topped the poll and was elected on the first count as was Brian McKenna. Brenda McAnespie was elected on the third count. On the town councils, Sinn Féin also made gains. In Ballybay, the party went from one to two seats, with Eugene Duffy and Barry Cunningham elected. In Clones, there were four Sinn Féin seats, up one on 1999. The four were Pat Treanor, Peter McAleer, Niall Quigley and Debbie Moore. In Carrickmaccross, the Sinn Féin representation jumped from one to three, with Eamonn Conlon and Noel Keelan joining Matt Cathy on the council. In Castleblaney, Sinn Féin went from two to three seats. The three are Jackie Crowe, James Cunningham and Maria Kelly. On Monagahan Town Council, the party held its four seats, with Gerry Loughran, Donal Sherry Sean Conlon and Pádraigín Uí Mhurchadha all elected. Sinn Féin won 3% of the vote and one seat here, with Michael Patrick Mulligan elected on the seventh count in Ballaghadereen. Sinn Féin won 8% of the vote on Sligo County Council, up 3.74% on 1999, with Seán MacManus holding his Strandhill seat. On Sligo Borough the party won three seats with Arthur Gibbons, Sean MacManus and Chris MacManus elected. In Tipperary North, Sinn Féin polled 3% of first preferences and 4% in the South. There were no county councillors elected but the party won seats in Carrick-on-Suir for Liam Walsh and Michael Browne in Cashel. Seamus Morris topped the poll in Nenagh and David Doran won a new seat in Thurles. 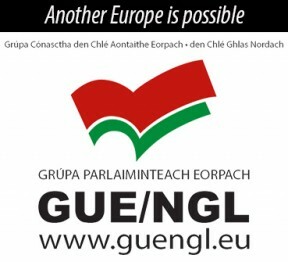 Sinn Féin didn't contest here in 1999 and this time around made a major breakthrough. On Waterford City Council, the party won 14% of the vote, electing two councillors, Joe Kelly in Ward 1 and David Cullinane, who was elected on the first count from Ward 3. In Waterford County, the party took 3% of the vote and a council seat for Brendan Mansfield in Dungarvan. Brendan also won a seat on Dungarvan Town Council. Sinn Féin won three seats on Wexford County Council and 9% of the vote. Jimmy Fleming won a new county council seat in Gorey as did John Dwyer in New Ross and Maurice Roche in Wexford Town. In the town councils, Jimmy Fleming was elected in Gorey, Noireen Sheridan in Enniscorthy, John Dwyer in New Ross and Anthony Kelly to Wexford Corporation. Sinn Féin took 7% of the first preferences in Wicklow but didn't win any county seats. Eamon Long was elected to Wicklow town council and John Brady won a seat in Bray.